The late-night arguments are over, the statistical comparisons and product specs are put away, and we've made our choice. 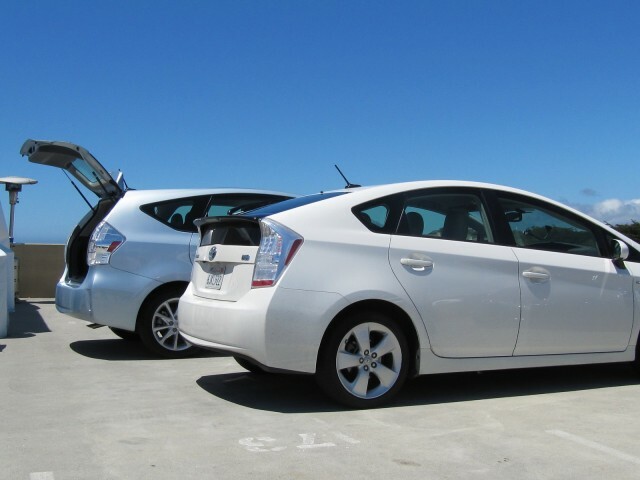 The GreenCarReports Best Car To Buy Award for 2012 goes to a pair of cars: the 2012 Toyota Prius V wagon and the 2012 Toyota Prius Plug-In Hybrid. The two new 2012 entries together make up two-thirds of an expanded Prius hybrid range that we feel offers the best way for new-car buyers with a variety of different vehicle needs to drive green. Judging from the regular stream of e-mails asking us when someone will make a hybrid minivan or wagon, Toyota should see a lot of interest in the 2012 Prius V wagon. It's taller, longer, and has far more load space--and a much more flexible rear seat--than the standard 2012 Prius hatchback. It looks every inch a Prius, even though it shares not a single body panel with the hatchback, and the EPA rates it at 44 mpg city, 40 mpg highway, for a combined 42 mpg rating. That compares to the hatchback's 50-mpg combined rating. And based on our the first drive review of the 2012 Toyota Prius V wagon, that 42 mpg figure is real--and can be replicated by real-world drivers. 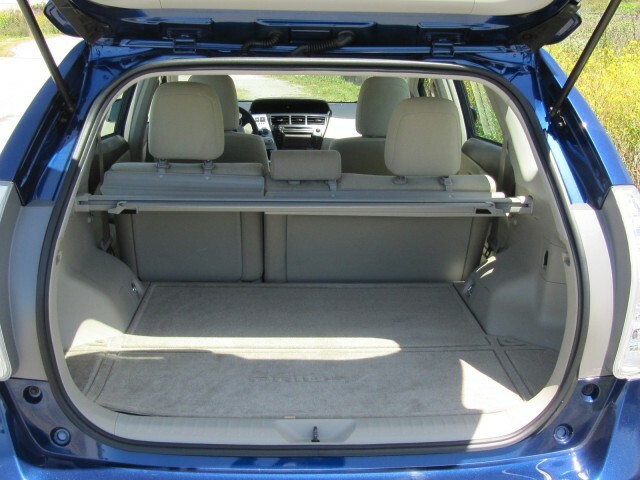 That means that families with a couple of kids in car seats now have 34 to 40 cubic feet of load space behind the rear seat, or 67 cubic feet with the seat down. The rear seat of the Prius V also slides back and forth several inches, expanding and contracting the load bay as needed. By comparison, the five-door hatchback Prius offers 22 cubic feet with the seat up. We think the Prius V expands the Prius range in a very useful and practical way, making Toyota's iconic hybrid capable of doing more of what cars are made to do: haul people and stuff around. Absent the odd badge or graphic, you have to look very carefully at the 2012 Prius Plug-In Hybrid to know that it's any different from a standard Prius hatchback. The best giveaway is the second round opening on the right-rear fender, which holds not a gasoline filler but a J-1772 socket for a standard 120-Volt or 240-Volt recharging cable. And that's the key to the car: It's Toyota's first plug-in vehicle since the low-volume 2002 Toyota RAV4 EV, the last Toyota that drivers could recharge from the electric grid. With the advent of the Nissan Leaf and Chevrolet Volt, the Prius Plug-In might be viewed as the worst of both worlds. 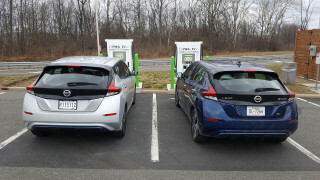 The Leaf offers 70 to 100 miles of electric range and never uses a drop of gasoline, while the Volt offers 25 to 40 miles of electric range--enough for two-thirds of the car trips in the U.S.--and dispenses entirely with range anxiety. 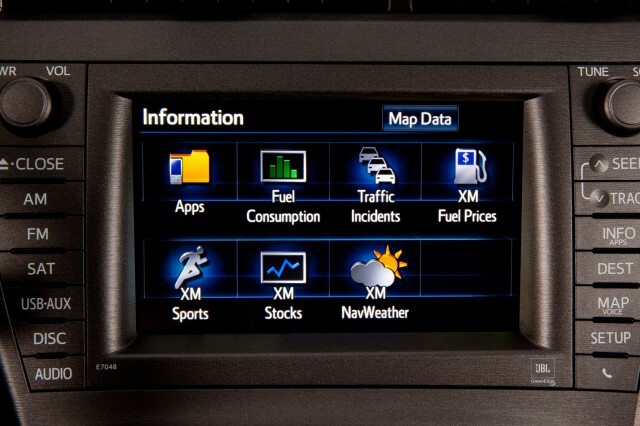 So what does the 9-to-13-mile electric range of the Prius Plug-In Hybrid provide? We think it will be viewed as the safest, least risky way for car buyers to experiment with plug-in vehicles. The production plug-in Prius carries an asset that neither the Volt nor the Leaf has: the Prius name, which for a decade now has stood for very high gas mileage and Toyota solidity. 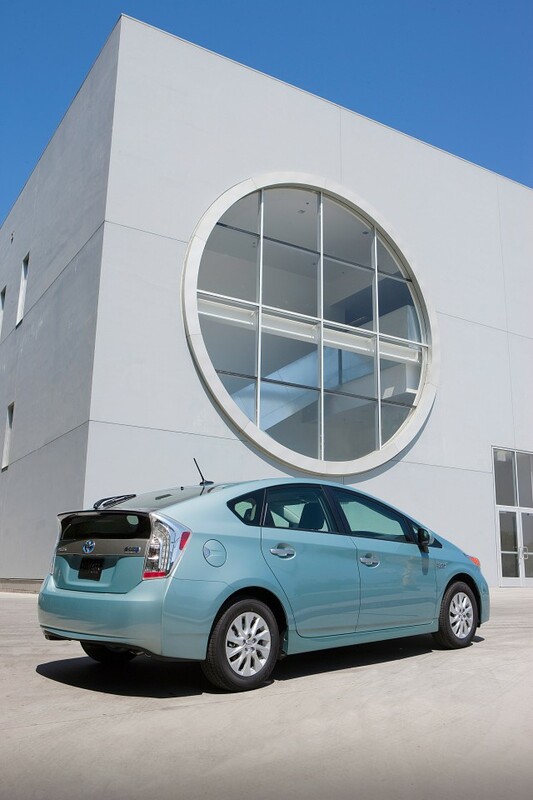 Compared to the Leaf, which for 2012 starts at $35,200, the Prius Plug-In starts at $32,760, including destination. Most plug-in Toyota buyers will qualify for a $2,500 Federal tax credit, versus the $7,500 for the Leaf--but then there's that lack of range anxiety with the Prius. Versus the $39,995 2012 Volt, the plug-in Prius is significantly cheaper even after the respective tax credits--not to mention it will hold five passengers and far more cargo than the tight quarters of the Volt extended-range electric vehicle. Toyota will sell the Prius Plug-In Hybrid, starting next March, in 14 states: California, Oregon, Washington, Arizona, Maine, Massachusetts, Vermont, New Hampshire, Rhode Island, Connecticut, New York, New Jersey, Maryland, and Virginia. 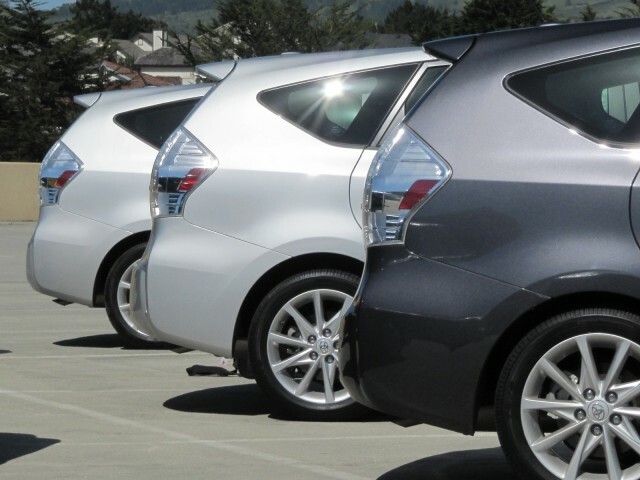 During 2013, the Prius Plug-In Hybrid will be rolled out nationwide. Each of the three major plug-in cars (Leaf, Volt, and Prius Plug-In) will find its own buyers and its place in the green-car pantheon. And if Toyota can sell more than 10,000 plug-in Priuses, it will significantly boost the population of electric cars on U.S. roads during 2012 and 2013. But for us, the addition of the two new 2012 models--one a wagon, one a plug-in--to the standard Prius hatchback means that the 2012 Toyota Prius lineup deserves the GreenCarReports Best Car To Buy award for 2012. For more info on the GreenCarReports Best Car To Buy 2012 award, see our dedicated page, Best Car To Buy 2012, which includes a profile of every nominee and more on the award itself (as well as last year's winner, the 2011 Nissan Leaf--the first battery electric vehicle sold in volume in many decades).